Continuing with another Eclipse Card - this time for Christmas. 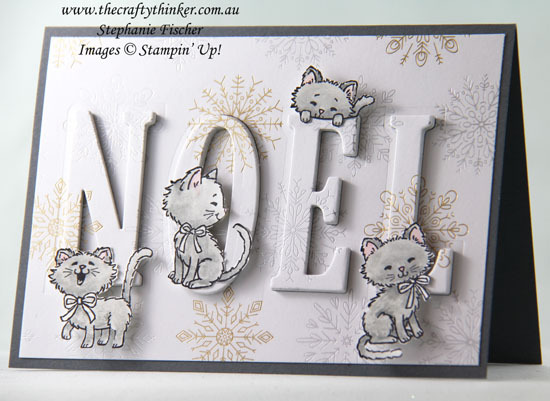 A Christmas card for a cat-lover! I'll be sending this card to a cat-lover this Christmas! I've just looked at these photos and realised that I forgot to colour in the ribbons around the cats' necks - so I'll go back and do that later! It was sooo simple to make! I used some Year of Cheer Specialty Designer Series Paper and the method set out here to create the raised lettering. 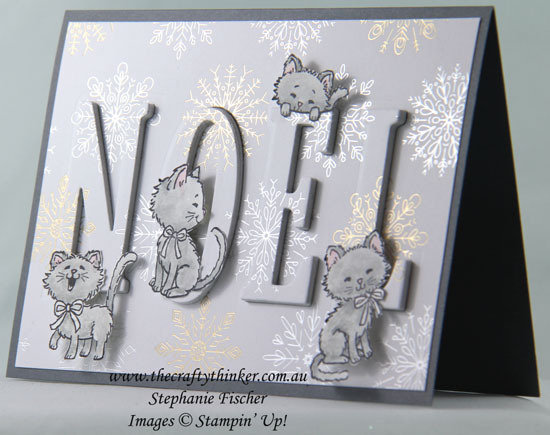 I stamped, coloured and cut out the cute kittens from the Pretty Kitty stamp and adhered them to the card front with glue and Stampin' Dimensionals. The raised lettering of the Eclipse Technique gives the kittens something to sit on!